This time of year everyone seems to go a little “pumpkin crazy” — and I don’t just mean carving jack-o-lanterns. In recent years, we’ve witnessed an explosion of pumpkin edibles – from lattes and beers to yogurt, ice cream, pretzels and even (yikes!) Pringles. But don’t be fooled, these foods usually don’t contain actual pumpkin. Most are flavored with “pumpkin” spices like cinnamon, cloves, ginger and allspice. With pumpkin-flavored foods at every turn, it’s easy to forget that pumpkin itself is a highly nutritious, versatile fruit that’s great for more than pie filling. In fact, pumpkin is a nutritional all-star. One cup of cooked pureed or mashed pumpkin provides about 50 calories, 2 grams protein, 3 grams fiber, 2.5 grams natural sugars and is loaded with vitamins, minerals and phytonutrients. It also contains vitamin C, iron, zinc, potassium, and is one of the best sources of vitamin A in the form of beta-carotene and several other carotenoids. Since most of us fail to get enough deep orange veggies in our diet, the new dietary guidelines emphasize the importance of getting 5-6 servings a week of red or orange veggies for their anti-cancer, anti-inflammatory and heart health benefits. 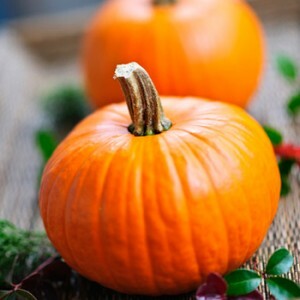 If you’re looking for better-for-you recipes featuring pumpkin, look no further than SkinnyTaste.com. Gina has so many pumpkin recipes you may need to get an extra pumpkin or two. One of my favorites is her Skinny Easy Pumpkin Granola. It has 133 calories, 4.5 grams fat, 3 grams fiber and 3 grams protein. Some of her other pumpkin recipes I like include roasted pumpkin sage soup (http://www.skinnytaste.com/2012/10/roasted-pumpkin-sage-soup.html), pumpkin butter and pumpkin banana bread. As the days get cooler, I love to celebrate fall with warm pumpkin muffins. Pumpkin muffins are ideal for breakfast or as an anytime pick-me-up. They’re 170 calories each, 0 grams saturated fat and 2 grams fiber. …And don’t forget the seeds! Pumpkin seeds are a nutritional powerhouse in their own right. They contain nutrients ranging from magnesium and manganese to copper, protein and zinc. Here’s a tasty way to enjoy pumpkin sees all year long. Preheat oven to 325 degrees. Coat seeds in melted butter. Add remaining ingredients and toss to coat. Spread evenly on a baking sheet and bake for about 30 minutes, stirring two to three times. Let cool.